The most common fossils are the Psittacosaurus species from southern Siberia to northern China, or possibly as far south as Thailand. The Psittacosaurus fauna contains: the theropods Kelmayisaurus, Phaedrolosaurus, Tugulusaurus, iguanodont Probactrosaurus, stegosaur Wuerhosaurus and protoceratopsids Microceratops and Psittacosaurus. Psittacosaurus is one of the best-known dinosaurs, as is its later relative Protoceratops. Psittacosaurus were gazelle-sized bipedal herbivores characterized by a high, powerful beak on the upper jaw. At least one species had long, quill-like structures on its tail and lower back. As many as 90% of the fossils found at some sites are from Psittacosaurus (Parrot Lizard), providing us with multiple complete Psittacosaurus skeletons. Not a large dinosaur; at about 6 feet it is the earliest known relative of the ceratopsians (Protoceratops and Triceratops). 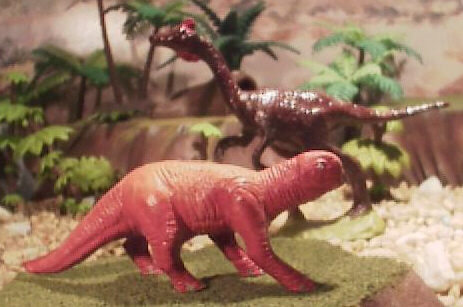 Garudimimus is older than Gallimimus, with 4 toes and horns or a crest above the eyes. 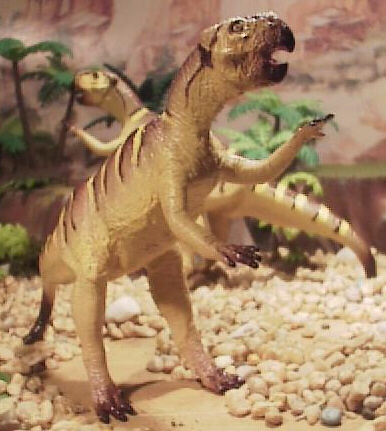 It lived in the early part of the Late Cretaceous. sides of the head, with short bony spikes jutting back from the sides of its head. Some had a small nasal horn. It had 4 long fingers on each hand. Evidence of parental care exists in the form of an adult surrounded by 34 youngsters. As many as 90% of the fossils found at some sites are from Psittacosaurus (Parrot Lizard), providing us with multiple complete Psittacosaurus skeletons. Not a large dinosaur; at about 6 feet it is the earliest known relative of the ceratopsians (Protoceratops and Triceratops). It is one of the best-known dinosaurs, as is its later relative Protoceratops. Eleven species have been referred to the genus Psittacosaurus. Wuerhosaurus was one of the last stegosaurs known, but is based on fragmentary remains. 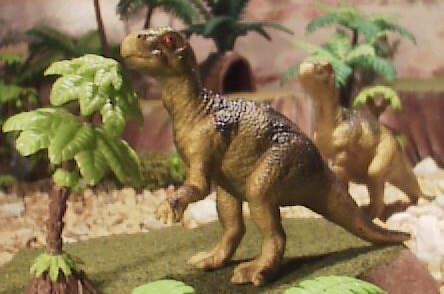 Stegosaurs die out in the Early Cretaceous everywhere, possibly from competition with new types of armored dinosaurs. Koreaceratops is a basal ceratopsian dinosaur discovered from South Korea. It is notable for the tall neural spines on its vertebrae. In some of the vertebrae, the neural spines are over five times the height of the vertebral centra to which they attach.